Will Peterson was a high school senior, sitting in his car at a stoplight not far from St. Scholastica, when he received a phone call he'll never forget. Bryan Karl, director of undergraduate admissions, called to tell him that he had been selected to receive a CSSyes scholarship. 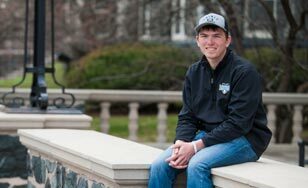 The news meant Will would be able to attend St. Scholastica, the college of his dreams since ninth grade. "I just remember getting really excited and emotional," said Peterson, who is now a freshman. "I felt so relieved that I could now explore my education and find out who I wanted to be." The CSSyes scholarship, along with a Benedictine scholarship and several other awards, were the culmination of years of academic achievement and planning that began when Peterson's mother encouraged him to sign up for the Upward Bound Math Science (UBMS) program. A single parent, she'd never had the chance to earn a four-year degree herself. She wasn't sure how to navigate the higher education system. However, she knew a degree would open a world of opportunity for him, and that UBMS could help pave the way. Through his involvement with UBMS in high school, Peterson spent five weeks on the St. Scholastica campus each summer for three years. He took classes, stayed in a dorm and participated in educational activities that sparked a love of learning. The experience — along with the encouragement of his baseball coaches — ignited his dream of attending St. Scholastica. "I had two baseball coaches who attended St. Scholastica and they told me it was a great place that felt more like a family than larger schools. They told me professors really care about you here. I've found all of that to be true in my first year here," said Peterson. He's discovering his passions and has made lifelong friends, he said. Though he's still deciding on his major, he's interested in education and coaching, and it's easy to see why. "I had a couple teachers who really made a difference for me and if I could give back and do that for other kids, that would be great," Peterson said. Peterson credits the UBMS and CSS admissions staff for working with him and his mom to make the financial part of attending college work. He's learned that most students can find ways to make a St. Scholastica education work for them financially. "Many students here don't come from families with deep pockets," Peterson said. "You just have to work hard and really investigate scholarships and financial aid options. There are a lot of opportunities available." "Helping students like Will make their dreams of attending St. Scholastica a reality is the best part of my job," said Karl. "I give Will and his mother so much credit for their foresight and perseverance in exploring programs and scholarships that made the finances work. Will is going to do great things with his life and I can't wait to see where a St. Scholastica education takes him." The CSSyes scholarship is designed for stand-out students who have great financial need. Available to incoming first-year and day transfer students, this financial package covers the remainder of a student's tuition after factoring in the Benedictine scholarship, other CSS scholarships and grants, and state and federal funding. This scholarship is renewable for up to three additional years or until receiving a bachelor's degree. The Benedictine scholarship is available to all incoming freshman applicants. This is a renewable merit-based scholarship, specifically focusing on the combination of cumulative high school GPA and composite ACT or SAT scores. To learn more about scholarships and financial aid options for undergraduate students at St. Scholastica, check out our scholarships and financial aid web pages or contact our admissions department at (800) 249-6412.